This is the more historic Waldorf Info, check this for current Waldorf Products: Waldorf Synth - today..
new it was 14500 DM (7250€) - atm it is around 3-6k€. 300 made. btw: µQ also has voice expansion or not: 25 or 75 max. Q plus 100 vox's max - in real life it will be below!.. btw: micro Q only demos for download are on patches section..! 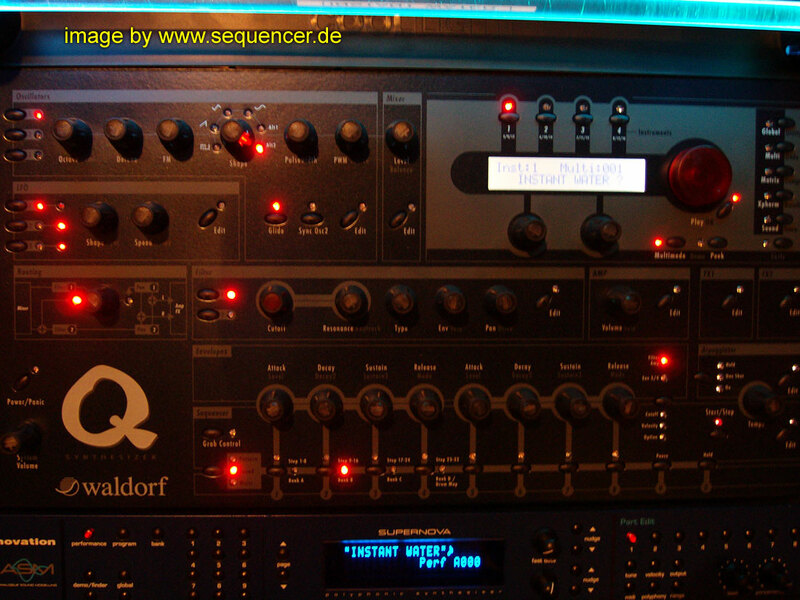 how many voices can the microQ do and what about the DSP-power --> DSP Power vs. Voices in Waldorf Q Series! READ about the new Waldorf Q plus and new OS 3.50 and above.. / affects normal Q,too..
here is a quick list and minitest with OS 3.54 (the most recent one).. and some things will come into the normal Q s too.. READ and watch the movies and pics.. COMPARED: Waldorf Q+ versus Andromeda? 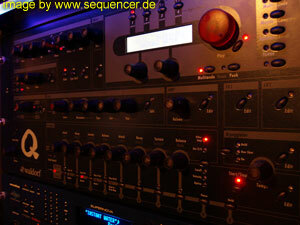 COMPARED: the andro against the moog modular..
To enter "Factory test" mode boot the Q with 'Osc-Edit' + 'Mixer-Edit'. --> at your own risk! the Q+ ANALOGBOARD the movie / video..
enlarge? info see Q plus test..
LESEN: Q plus / OS 3.50 / kommt auch für normalen Q XT aussichten OS 3.0, aktuelles QOS 3.52. Q+ ANALOG-BOARD the movie / video..
vergrössern/enlarge? info siehe Q plus test..
(das oben ist übrigens die Q Platine.. 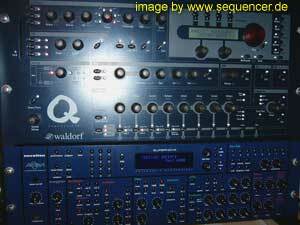 COMPARED: Waldorf Q+ vs Andromeda? latest OS 3.02 - some bugs have never been fixed - sync of arper possibly not working on the Q rack..
(D) der microQ Testbericht / Review!! Hörbeispiele dazu sind unter patches.. COMPARED: Waldorf Q+ gegen Andromeda? bei der microKUH ist das routing nur schaltbar und über 3 modmatrix routings kannst du allerdings dennoch ein routing machen wie beim grossen..
das morphing fehlt beim micro und die FX sind auf 5 zurückgestutzt und die stimmenzahl dynamisch. 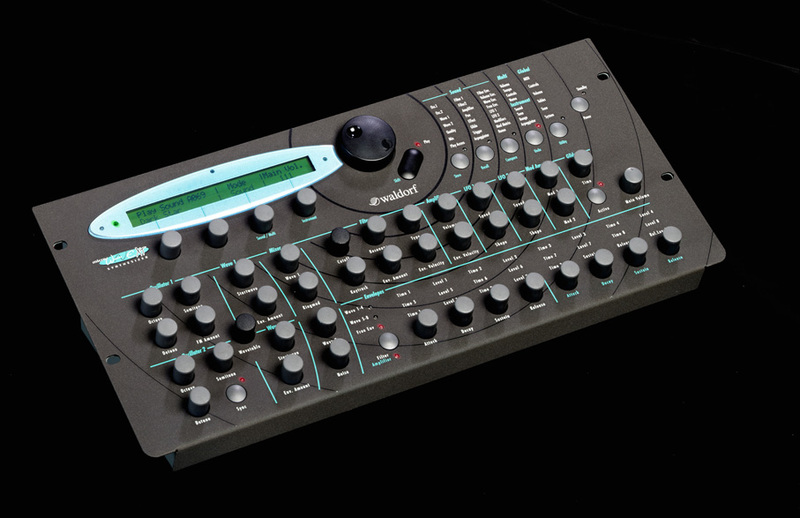 minimal 12 (beim kleinen) die wahrheit liegt so bei 15-16 stimmen..
gute 40-50 gehen damit ..
und natürlich fehlt der sequencer und die bedienung ist nur sone matrix wie beim DSI evolver etwas anstrengend aus heutiger sicht.. aber alles CC'bar..
the Microwave went digital & got knobs..
das XT OS 3.0 wird nicht kommen! XT OS: discontinued ,april 2003 - it's 2.33! to erase the entire flash contents: press+hold the Global+Undo buttons at startup. Indeed the Microwave XT officially is discontinued april 2003, that's true. There will be a final amount of XT 's and XTk 's available in the near future, the "remnants" so to say. I don't know the numbers and when these will be available, I'm sorry. This of course doesn't mean we will stop the support for the Microwave XT and XTk. 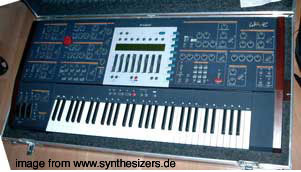 Also the Wavetable Synthesis will show up again in future products, but the XT(k) production is stopped after being on the market for nearly 7 years, since the Microwave II was introduced back in 1996.
of course the ppg plugin Wave 2.X is still sold and now works with the afb as analogue filter (called red), so wavetables may appear in read some time..? but imo that plugin is not even close to the power of the microwave series..
pulsar has a nice waldorf OSC, but it is limited to the ROM waves and wavetables only. also you find it in the noah. same limitation here: so the WAVE/microwave series is the only one to edit your own waves and tables..
could the Q / microQ do this job as XTQ+? the official answer (jörg hüttner 5/2003) :Not only the "old" Q's wouldn't be able to do this. There's simply not enough RAM in the machine to allow something like User Wavetables. So that's something even I can negate. (D) Alternativen: natürlich gibt es immernoch das ppg plugin wave 2.X ,welches auch als "red" mit dem afb analoge filter bietet. dennoch ist dies sicher kein ersatz für die microwave serie.. leider..
alternative 2: pulsar, hier gibt es im modular einen wavetable OSC,der allerdings nur die ROM wvaes und tables anbietet, man kann hier also keine eignen waves oder wavetables bauen.. diesen OSC findet man auch im Noah..
kann das denn nicht ne kuh (Q) machen? oder microQ? also eine art XTQ+? antwort jörg hüttner 5/2003: Not only the "old" Q's wouldn't be able to do this. There's simply not enough RAM in the machine to allow something like User Wavetables. So that's something even I can negate. 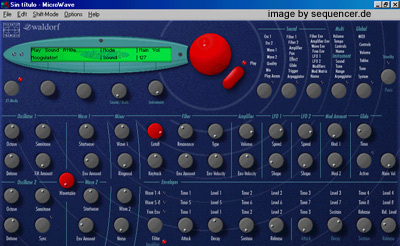 KLARTEXT ÜBERSETZUNG: heisst also: wir müssen auf ein neues buntes waldiprodukt warten,wenn wir einen neuen tollen wavetable synthesizer wollen,der auch editierbare wavetables hat..
Der Blofeld? Naja, der ist kein XT-Nachfolger, er ist mehr ein Q Nachfolger, siehe XT vs. Q Vergleich. - Er hat aber alle Wavetables, man kann sie aber bis 2009 zumindest nicht editieren, kann ja noch kommen. I did a track on a 10voice Waldorf Microwave XT only..
go to Waldorf (for download or get the ConseQuence track from the waldorf site under XT demosongs!! free!! or at www.consequence.info under audio! 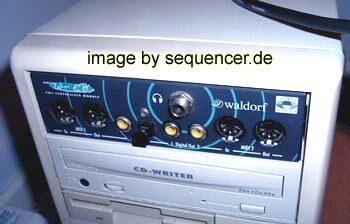 also some on Moogulator / Consequence CD "GedankenRauschen"
a teratec product since terratec and waldorf "worked together" for a longer time and now the microQ is available as "komplexer" from terratec from the waldorf programmer of the mwII/XT..
the MICROWAVE PC is a combination of an older terratec card and the microwave with 10 voices, there is also a XT - lookalike software editor since it has to be edited in some way..
the microwave pc was pc only since terratec is not that mac friendly..
above: the waldorf VST plugin ppg 2.X, which is an emulation of the ppg wave synthesizer, well since waldorf is dead this plugin is also history.. unfortunately. eigentlch ein teratec produkt , denn Waldorf und Terratec arbeiteten seit diesem Zeitpunkt zusammen, heute gibt es ja den "Komplexer" Softsynth , der letzlich ein microQ ist, leider genau wie der MW PC nicht für den Mac, aber Terratec war ja nie so sehr macfreundlich..
die software für den MW PC ist faktisch eine optische Kopie des MWII und des XT. Nicht mehr oder weniger. Etwas viel "Originaltreue", aber es funktioniert. 10 Stimmen in Kombi mit einer (heute alten) Terratec Soundkarte und digitalen Audiointerfaces. Kompakt und smart. 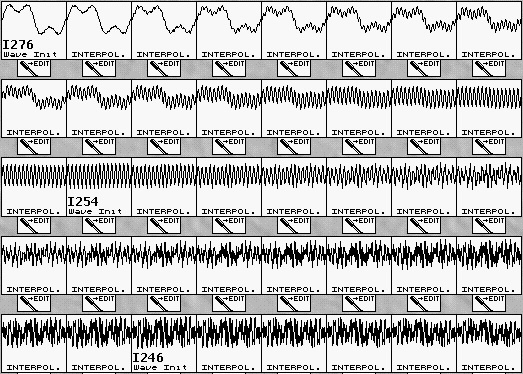 über dem Screenshot des MWPC ist der ppg 2.X, (emulator des ppg wave 2.2) der auch von Waldorf via Steinberg vertrieben wurde. Den gabs allerdings auch für Mac, GAB es? 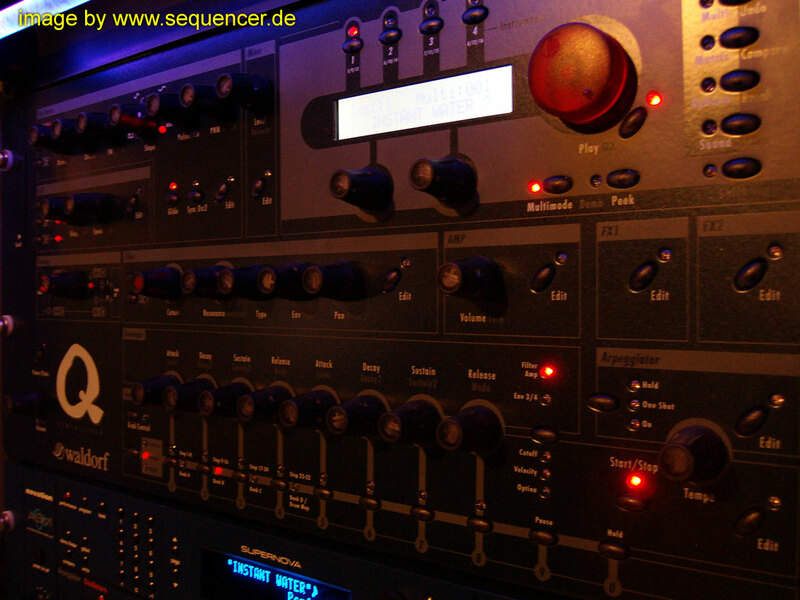 ja, Waldorf ist ja nicht mehr da, daher gibt es auch das PlugIn nicht mehr.. schade..
thx to Javier Zubizarreta for pics..
the waveslave , a displayless expander only works on V1.2 and below, the current and last os for the classic "old" microwave is V2.0 and can be burned on EPROMS (2 eproms), the data can be downloaded at waldorf! special edition (green) see below..
microwave 2 and XT - whats the difference? unterschiede microwave 1 (MW1)- MW2 - XT und alternativen..
MW2: warning there are 2 versions of the microwave 2: the later ones got more DSP ram - you can check it easily: it contains the delay effects! if it does not, its an older one!! this is the only difference! the delay effect! you can upgrade the DSP ram by uprgading to 30voices. all 30voice-versions have the full DSP ram! both models were available with 10 or 30voice. 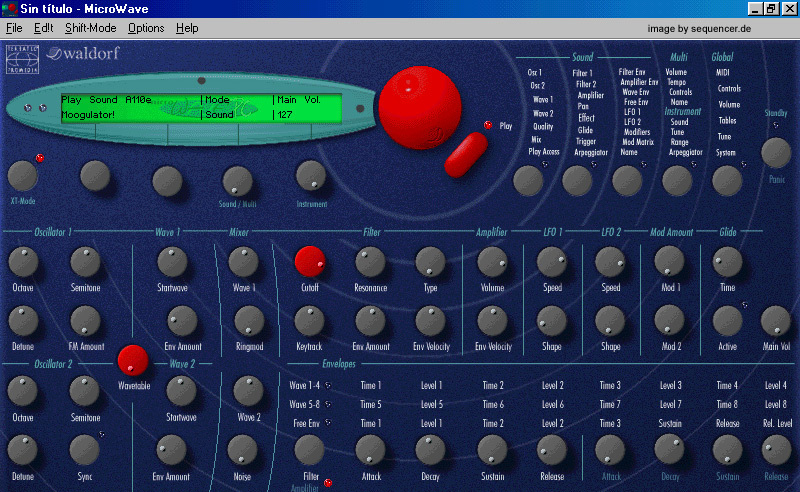 the V.2.0 version offers a lot, so if you are NOT using V.2.0 in your microwave you get more wavetables, lots of new features and synthesis features!! a big jump!! so very recommended, btw the speech robot from georg müller only works on the old microwave,too! difference: the newer XT and MW2 are digital, you can set the "quality and aliasing in the new ones to make most of the sounds work on the new microwaves,too but there is one thing that can not be made: the strange psycho-sounds that can be done using the overdrive of the mixer. it is an analogue one so the ringmod-kind of sounds semm not to be portable to the new XT and MW2!! so its about 95% of all sounds that work on the MW2 and XT..
the access progger: is a nice tool, but please don't forget: it sends sysex, not controllers (the mw1 only understands sysex data, but you CAN assign 4 CCs from another box..) and it doesn't offer the FULL parameter set of the mw1 !! keep this in mind. btw: it's discontinued.. the company has lots of virusses (virii?) now ;) - no ,it doesn't work with the MW2 or XT! nice to have , but not all parameters are supported -- eigentlich sehr hilfreich,aber bietet nur einen TEIL der parameter an..
(D) Microwave2 - was beim kauf beachten unterschiede microwave 1 (MW1)- MW2 - XT und alternativen. der waveslave (erweiterung zum alten Microwave 1) funktioniert nur bis OS V1.2! das letzte OS (in form von 2 eproms) gibt es bei waldorf auch zum download,man muss nur einen eprombrenner haben! Das OS V.2.0 ist extrem empfehlendswert und bietet neben mehr wavetables eine grosse menge an funktionen und features in der gesamten synthese..
die filter sind analog und daher sind die neueren microwave II / XT / XTk auch klanglich ein wenig anders, dafür gibt es wesentlich mehr filtermodelle, FM und sync in den neuen! es gibt dort auch ein menü um den alten klang ein bisschen nachzuahmen (runtersetzbare qualität auch prima missbrauchbar für spezielle sounds).. es gibt nur eins was der neue nicht kann,was der alte konnt: es gab die möglichkeit den mixer ein bisschen zu übersteuern und damit analog einige fast ringmodulationsartige psychosounds zu machen! das muss man im XT/MW 2 dann anders angehen.. die FM im MW2/XT ist übrigens echte FM, nicht Phasenmodulation, wie das oft bei angeblichen fm synth ist! eigentlich sehr hilfreich,nur vergessen viele: er sendet nur Sysex, keine controller (weil der mw1 nunmal auch nur sysex frisst) und es sind nicht alle parameter auf dem programmer zu finden.. er wird leider nicht mehr gebaut. versuche ihn nicht mit dem MW2 oder XT zu nutzen ;) das geht natürlich nicht,weil diese mit controllern gesteuert werden. da eignet sich eine knopfbox von doepfer oder evolution oder ibk ohne ähnliches..
can be stacked to have polyphonic sounds..
searching for one? check the encoders! Ringmod wird erzeugt durch XOR Ansich ist er Hybrid, nicht komplett analog, dennoch bringt er sehr gute Bässe und mehr..
stackbar mit mehreren PULSEs zu polyphonem synth..
Kauf: Achte auf funktionierende Encoder, die sind nicht so superstabil.. wenn mal was nicht funktioniert hilft auch der encoder austausch..
latest OS 2.33, for XT: 2.29 is enough since the more recent only had updates for the XTk! weitere vergleiche der einzelnen microwaves unten..
Q: 2 fixed wavetables but 128 waves insteadd of 60, but the XT ones can be edited via computer..
XT: has 8 step rate/level envelope, Q has complex env but not as fine as the wave env ..
LFOs: that point goes to the Q, it's 2600hz compared to (still fast) 100hz on the XT. the XT has a imple 6dB/oct lpf or hpf second filter.. but no resonance. but it has quality settings to reduce audio for lofi FX..
any OSC can mod any other OSC on the Q, the XT has FM ,..
Q: 3 oscs plus 2 sub oscs (when Wavetable is selected) - XT: 2 oscs, no subs. Q: more FX inkl vocoder and reverb: XT: max 3 fx: only delay and distortion. es gibt 2 filter.. der Waldorf Microwave XT hat nur einen 6dB resolosen "hilfsfilter" zusätzlich..
dessen Hüllkurven sind recht gut, aber sind mehr als nur ADSR. alles in allem haben sie also nicht sooo viel gemeinsam. die modmatrix des Waldorf Q / Waldorf microQ hat auch schnellere quellen an bord "die fast matrix"..
die lfos des Waldorf Q / Waldorf microQ gehen bis 2600hz, beim XT sind das 100hz. dafür aber nur 2. und anders designed.. eher als eine reihe von mehreren wavetables als "all purpose" waves..
der Waldorf Q / Waldorf microQ hat einen digitalen ausgang. der Q hat wesentlich aufwendigere FX und bietet auch HMT (reinstimmung)..
der XT kann keine kammfilter,da er nicht genug dsp ram hat.. aber es wird eh keine updates mehr geben..
rack attack pic thanks to ASSI click the image to enlarge..!!! racked Attack also as VST plugin - I guess this was the first hard AND Software synth - in this case for drums and bass, fm is possible. das erste auch als VST plugin erhältliche gerät, gibts auch als hardware (! ): für drums und bass, fm ist auch möglich. the older XTs (including the black ones) had bigger knobs, later ones got small "q-style" knobs (smaller), they only changed the colour scheme and "opacity" on later models, the red Q+ and late Q models look nice with these. Wave:300 Waves have been made. the standard color is blue, same as PULSE or the old Qs, was also available in red or yellow "sahara"..
NIN (nine inch nails) Charly Clouser got 2 XTks in "black" for an MTV apperence..
Q: nextel versions (old) are yellow and blue (like the wave/PULSE see pic above), lots of ppl confuse the colors but there is really no black or grey onw.. it's blue!.. the next "classic" series did not have the nextel surface anymore but were blue.. ;) the Q+ is only available in red. ein schwarzer XT wurde in Deutschland einer kleinen Auflage gebaut (angeblich 666stk., aber das ist nicht überliefert, sie haben alle die dicken alten Knöpfe, nicht die schmalen wie im Q) dh,, Darth Vader lässt grüssen. auch wenn Schlachtschiffgrau eigentlich die bevorzugte Farbe gewesen wäre. ältere XTs (auch der schwarze) haben noch die "dicken" knöpfe, spätere haben dieselben ,wie heute im Q verbaut werden..
es gab rot,gelb etc.. es wurden 300 Waves gebaut. für NIN (nine inch nails) Charly Clouser wurden für einen MTV auftritt 2 XTks in "schwarz" gefertigt. CME + Waldorf Nano Synth? USB2 was a problem at that time since no computer HAD USB2..
the afb was a filterbox to use with the computer via usb2 .. it never really sold.. so..
* can be inserted in apps/Plug-Ins, but must be done by waldorf.. so maybe sometimes as a plugin in logic and cubase.. maybe with env follower..
* Waldorf Rot Analog Filter Step Sequencer some sort of reso and cut 16step sequencer inlcuded..
mit dem afb16 von waldorf kann man per usb2 (leider nur usb2!!) 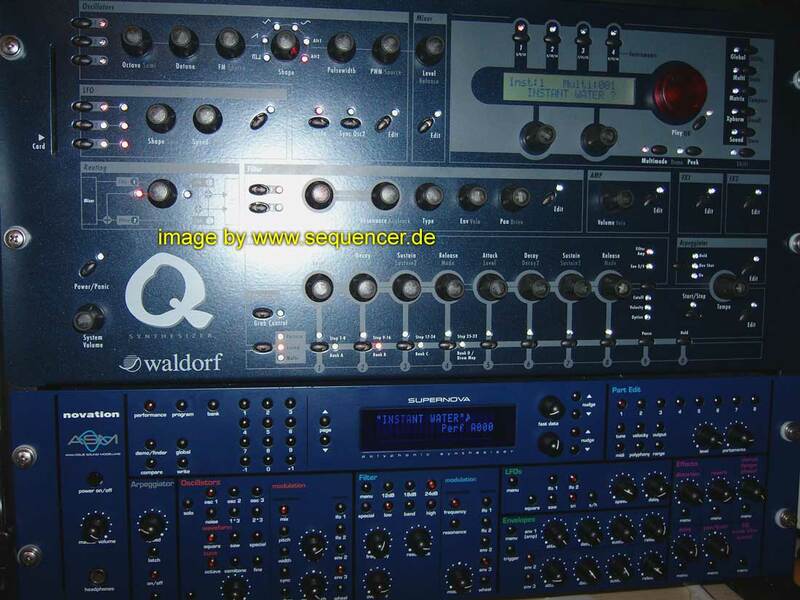 die analogen filter des Waldorf Q+ nutzen! diese haben drive (zerrung) ,VCAs und LPF 12dB/okt und 24dB/okt flankensteilheit! meint: anstöpseln und zB das ppg plugin red nutzen,welches dann ANALOG FILTERT!! denkbar wäre hier auch ein modulares system oder den AFB mit reaktor zu nutzen,solange es treiber gibt..
attack und wave 2.V waren nicht übel und finden sich heute auf div. Heft-CDs wieder. hardware analoge filter box für software wie Reaktor wäre sicher ein dicker Hammer gewesen. Hat bisher auch keiner versucht. Aber die Sachen klingen heute auch besser, evtl braucht man ja auch kein "analog" mehr für sowas? was planned 2007 but never happened, so it will not happen on pre-Blofeld models. So do not expect any news exept for Stromberg & Blofeld and later synths. 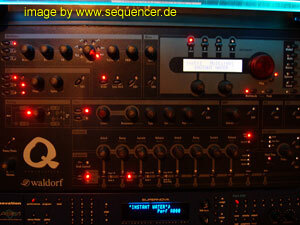 I was happy, when Waldorf returned, but the old synths work quite fine, including Q, Q+, XT.. Some bugs remaining.. BAckup was: waldorf.synth.net then. Stefan Stenzel created Stadler (means Stettler, the one beside Waldorf in the Muppets Show) and the Komplexer was released as Teratec Komplexe (Plugin, PC only) - thats the Largo today. Wolfram Frank went to Access, but came back with Stefan. Of course you can reach them via Walforf again, today. Waldorf went into insolvency in Feb.2004 and came back in late 2006 with the Q+ as Phoenix edition along with a Micro Q Phoenix Edition - all limited editions, they announced Blofeld and Stromberg, Blofeld came later than expected. there are some talks under the woods.. and the old mailing list is back also..
(D) JAWOLL! Waldorf sind wieder da - korrekt: waldorf sind wieder da.. daher muss ich meine alte kaputte waldorftasse durch ein bild einer meiner funktionierenden ersetzen ;) - es wird OS updates gegen geld geben (plus div features) für mindestens die Q serie und inkl bugfiexes.. zur NAMM 2006 (winter) wird ein neues Produkt erwartet.. man kann auch wieder Kühe kaufen, den XT gibt es leider nicht mehr, aber das war sicher vielen klar.. aber den Q+ gibts wieder! URL http://www.waldorfmusic.de/ auch gibts die alte mailingliste wieder..
waldorf war jan/feb 2004 insolvent und existiert seit 2006 wieder! Spiegelseiten waren bis dahin: : waldorf.synth.net incl. mailing liste. remember waldorf & statler? die opas aus der muppets show? Naja, Stettler heißt der eigentlich.. die firma ist kein "nachfolger"! aber das wissen über die waldorf geräte haben sie noch, daher ist es anlaufstelle nummer eins bei Waldorf Fragen "Nachfolger" sind Holger "tschings" firma audio workshop und stadler electro (stenzel & co) und wolfram franke ist nun bei access. Dh: Jetzt nicht mehr, wieder zurück bei Waldorf. Die Familie ist wieder da, fast in alter Besetzung. Exchange of "Endless Encoders"/ Tausch der Endlos Dreh - Encoder im Q? wie es geht. Waldorf Q, XT etc..
Rene Klug hat einen kleinen Bericht verfasst im DIY Menü findest du den BEricht ,wie man die Encoder austauschen kann..
 Using Q external inputs: external audio for the Q?? how to set up..
no chance for phasing or pad like sounds, but basses..
more close to 60 (maximum number of waves) will be more accurate but also more stepped, less will be more smooth but of course less "spectral key points".. after that scan the wavetable linearly by the Wave Envelope.. SAMPLES (WAV) ANALYSIEREN UND DAMIT WAVETABLE ERSTELLEN? about HMT the more well tempered synthesizer - pure scaling / intonation and scaling. Some Waldorfs got HMT: Q+, Microwave 1..
Was ist HMT / Hermode-Tuning?  generelle infos im hauptmenü "grundwissen" zB wie klingt ein wavetable.. auch einiges unter patches zum anhören! 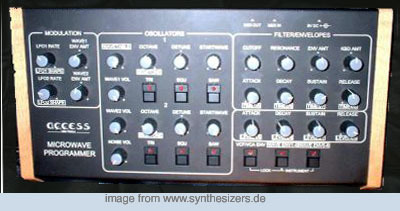 Historic Section - get recent data via SynthDB here: Waldorf Synth overview..
note: all articles saying XT means MW2/XTk (in most cases!) MW means microwave (the old one) MW2 means microwave 2 (XT without knobs see below for mw2 info).. its all the same sound engine!!.. of course this is the same game with Q and the RackQ (raQ/Qrack?).. - Track 22 : with both oscs now - dito, mit beiden Oszillatoren! Sounds/ Download / Audio / Patches!! 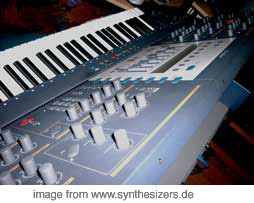 & Synthdemos!! Audiostuff, mp3 Demos & stuff & Vocoder fun.. find audiofiles & patches here.. also some Wavetables that I made.. for listening also..
Sounds & Vocoderzeux.. auch ein paar Beispiel-Wavetables zum anhören also Audio UND Patches!! 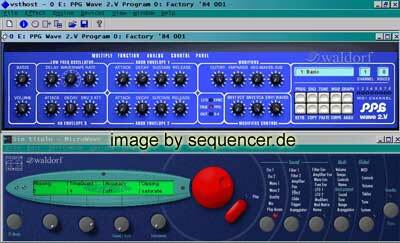 wavetables compared to vector synthesis ..
 german TSI (that was before 2004, no longer exists) now going to enter the "granular" market?? 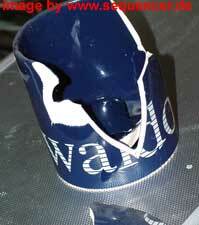 the proof..
 Waldorf Q ... OS5.23 -- 3rd party OS5.23 are there companies that write another OS for the Q ?